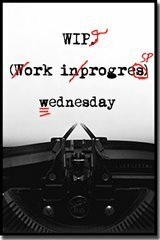 Posts WIP Wednesday: A HA! Sorta. WIP Wednesday: A HA! Sorta. Remember how I was going to have my Williams Project all put together with two new chapters written by today? If I did it, Ryan Bridger aka Battle bunny has to write a song that Mason aka Head Wombat will record. If I don’t do it, then the book is “officially” written by Ryan Bridger. Well, that’s motivation for ya. I am pleased to announce that I accomplished my goal (clap, woo! Cheer!) BUT I was shocked to realize how many holes are in it. This was a great exercise because now I know exactly what to fill in. Booya. I also have 5 out of 10 subs out for #10bythen. I’m proud of this, but I’m also a little leery because I’ll be pretty much out of commission this week (yay vacation!) and I didn’t get as much accomplished as I had hoped this week. A quick spin in the ER put me behind, but all is well and I’m back in the saddle. Ish. I’m taking it slow. So! I’ll be reading some of my work on RB Wood’s podcast that will air October 17. The good news? You can do it, too! He’s still looking for authors and needs your piece in by October 14. That doesn’t give you very long, but hey, who doesn’t love a challenge, right? 😀 You can find the guidelines here. Join me! Congrats on accomplishing your goal! !